What a ride! Absolutely love the S&D podcast novel. Myke Bartlett knows how to write and his narration is spot on! I’ve listen to this and his Electricity podcast novel over and over!! While he is pursuing a journalism career, I hope one day he will return (to what this fan believes is his true calling) and pick up where he left off. 🙏🏾🙏🏻🙏🏽🙏🏼🙏🙏🏿🙏🏾!!!!!!! Perfect for listening at work or in the car. Great narrator. Interesting story line, well thought out. Cute love story. It had it all. I would love to see this turned into a movie or tv series. Fantastic yet dark world with hope and optimism sprinkled in for good measure. I too could see this as a fantastic TV series!!! There is so much tripe out there this would really give the thoughtful something to ponder. I've been savoring this novel-of-sorts because I don't want it to end. The story is well crafted and the way Mike Bartlett (the author) reads it is an art form in & of itself. I'm super entertained by the adventures of Kilbey, Nero, Theo & the lot. I adore this author! The story is inventive and deep while still being funny. I am saving it to listen again and again. You will enjoy! I would love to see this as a tv show! Love this book. This should be a movie. Better than all the other rubbish on cinema today. Great story. A little rambling toward the end but the descriptions of London-living are amazing! Very imaginative, part sci-fi/fantasy part noir detective story. I really enjoyed this one. Since I've discoverd "free" podcasts I've become hooked. The thing is with Myke's free podcasts I feel guilty because they are free - but the quality isn't. They say you get what you pay for - not here. You get the best music, the best voice, the best characters and story-line. There's intrigue, suspense, plot, action, and romance that's not gushing all over the place. Listening to "Electricity!" Just started but I'm not disappointed. Well-written, fascinating tale. Myke Bartlett does a terrific job as reader, too! What a full on wonderful book! Three cheers and kudos for Myke's powerful, imaginative, fantastically original story. There is nothing off-the-shelf here, nothing but a new and enthralling take on the everyday here-and-now, but with such twists! Amid and amongst us is a dark and dysfunctional society, which can see ours, but we don't realize they are everywhere. Brilliant! Myke engages us in this tale for the control of existence fought beneath our noses. The narrative voices are spot-on for the characters, consistent, and vary enough to make this seem like a fullcast production. The audio ( from 2006!) is a bit rough at first, but any issues are quickly forgotten as we are swept along crisis to disaster, as the action builds. Music is subtle and a perfect mix. The website supplies cutting-edge artwork to help paint the proper picture. As you can tell, I am most impressed with this journeyman effort. Myke, please hurry up with more from Salmon and Dusk! I am going to see what else I can find by this author...excellent ride. The title aroused my curiosity and Myke's superb pace and dialog kept me listening, but the reality he created kept me coming back to find out what would happen next. Thanks Myke Bartlett for Kilbey, Nero, Theo, and the Fallen. was a totally trippy adventure but loved every second of it. i'd gladly put this book next to my haruki murakami collection. this is an extremely well written novel. the story unfolds wonderfully and is never rushed, giving you time to become attached to the characters and savor their adventures. myke bartlett has joined the ranks of my favorite writers and just as importantly for a podcast, he is excellent at reading his own work, which can be a dicey business. Thoroughly enjoyed listening to this book. If you like "How To Disappear Completely", check out "Electricity" -also fun, also by Myke Bartlett and also available on Podiobooks. Refreshing and intriguing with layers of intricacy you don't expect. Absolutely the best Podiobook in existence! I'm surprised that this book has not received more attention. This is absolutely the best podiobook that has been released (and I have listened to a large number. The story is extremely well-written and develops slowly drawing the listener into the characters. It is very intelligently written and extremely well performed. Myke's voice and reading is style is the best that I have heard on any of the podiobooks. His wit and humor are easy to relate to - especially for those who are well-travelled. I can't wait for Myke's future books. Both this one and Electricity are unique in the podsphere and I expect will gain a strong following in future years. Ok, I listen to many many stories. Not very many have caused me to go buy CD's and then burn them with the entire series, and mail them to everyone that I know. Ok, this is the only one. The prose is indescribeably gorgeous. Perfect. Myke's voice is amazing. The story is engaging and wonderful. I can't say enough good things about this novel. There just aren't the words. I want to have Kilbey and Theo and Nero over to dinner. They are all so believeable in such a fantastic story. Just download it, you'll see! I was unable to stop listening. The tale invaded my art and conversations. It saturated my Dreams with shadows and mystique. This was definitely worth every minute of my time. Takes the whole genre to the next level. Definitely the cream of the crop. Although at times it bogs down in wordiness, the story and characters are among the most interesting and compelling you'll find. Over all "How to disappear" takes the whole genre (of podcast novels) to the next level, and leaves you pining for the next installment. I loved everything about this story. The reading is excellent, the characters are dynamic and the plot advances with the perfect amount of mystery. I'd recomend it to anyone whether they like "sci-fi" type stories or not. After enduring 5 segments of this novel, I couldn't bear to hear another description of the surly, sullen self-absorbed losers lighting another cigarette and swilling another drink. What a waste of time when there are so much better podcasts out there to listen to. And way better books to read. This was the first audiobook that I've been able to listen to all the way through. Myke did such an amazing job - the story, characters, and storytelling were just wonderful. I think everyone needs to listen to it right away! This is a story that carries a compelling momentum right through to the end, and Myke's performance gets better and better as the chapters progress: great storytelling, diverse and interesting characterizations, and a moving emotional presence. Plus!! I mindlessly completed an incredible number of home-projects by listening to episode after episode. Thanks, Myke... my apartment's new color scheme is brilliant! Wonderful story, imaginative, dark, funny. illuminating. The characters become real; I cared about them. Most of all, the writing is excellent. Mr. Bartlett has a solid command of language and phrasing. He describes just enough to allow the readers imagination to fill in the blanks unlike the current trend of infinite, boring detail. I will listen to this again. It is so rich I know I will pick up ideas I missed the first time. This is a well-done, odd little story set in a somewhat alternate London; if you enjoy Douglas Adams and/or Neil Gaiman (especially Neverwhere) you'll find this one a lot of fun; conversely, if you enjoy this, definitely check out both Adams and Gaiman. You'll not be disappointed, either way. Looking forward to having a book I can carry about and hand to friends who complain of nothing new to read. Kudos to Mr Bartlett. The plot and characters have come together nicely in this thrilling science fiction 'film noir' audiobook. It is well written and well read. I can't wait for the rest to be released! this is fabulous, but when is the rest of it coming!!?? i have already listened to all the episodes so far! AMAZING story...I am anxiously awaiting more eposides so I can find out how Theo makes out! 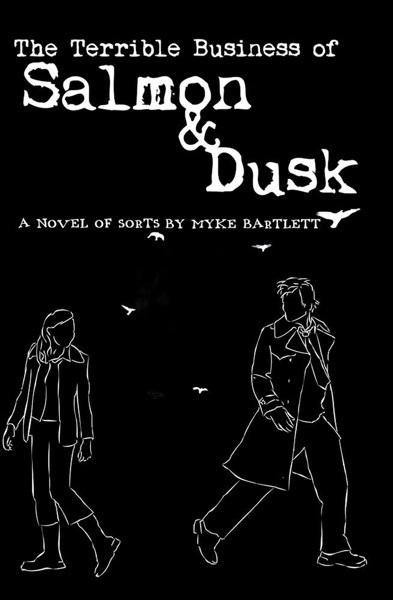 I hope that Myke Bartlett keeps on writting!